Remember that time I went to Las Vegas for the World Food Championships? Well, I'm attempting to get there again! 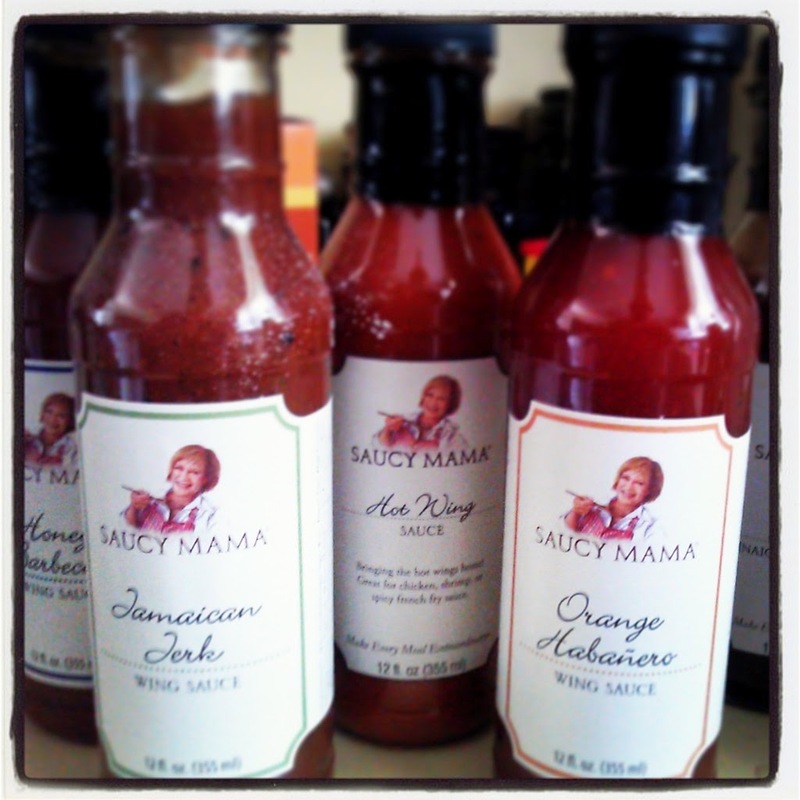 I applied to be one of 25 food bloggers to receive SIX of Saucy Mama Cafe's signature sauces and vie to create the best recipe using one or more of the sauces. AND I WAS SELECTED! The judges are looking for creations that are easy to recreate, great for families and/or parties, that are delicious and inventive. I was blown away by the quality and taste of all the sauces. After an impromptu tasting, I chose Honey Dijon Dressing and Orange Habanero Wing Sauce for my dish. Even if I don't win, I'm still going to add Saucy Mama Cafe to my stash. Stay tuned for a Saucy Mama product giveaway on Nik Snacks very soon! The Honey Dijon Dressing is sweet with a tang of dijon that could be used in sweet or savory applications. Pairing it with the extra-sharp white cheddar in my biscuit really ramped up the flavor to notches unknown. Have you ever put mustard in a biscuit? Me either. Not until today. The Orange Habanero Wing Sauce?? It needs to description, but it was perfect. It starts out sweet, then kicks you with spice and becomes rounded out again by more sweetness. The perfect accompaniment to bacon, you're gonna love my jam. Preheat oven to 400°F. Place stick of butter in the freezer for a minimum of 20 minutes, to freeze solid. Combine flour, chives and white cheddar in a large mixing bowl. Use a food processor or box grater to grate the butter into the flour mixture. Use a fork, two knives or pastry cutter and process the mix until the mixture forms crumbs the size of peas. Combine Saucy Mama Cafe Honey Dijon and milk in a measuring cup. Drizzle the milk mixture over the flour until mixture comes together. Mix only until roughly combined. Dump out onto a well-floured surface and roll the dough out to into a rectangle. With a sharp, floured knife, cut the dough lengthwise in half and then across in quarters, making 8-10 squares. Alternatively, use a biscuit cutter or a drinking glass dipped in flour to cut out 8 biscuits. Re-work the scraps and cut out 2 more biscuits. Place the bacon in a large cast-iron skillet, pot or Dutch oven over medium to medium-high heat and cook, stirring occasionally, until the fat has rendered and the bacon is starting to brown and crisp up, about 10 to 15 minutes. Do not discard the bacon fat. Add the onion, and cook, stirring occasionally, until the onions have become fragrant and translucent, about 5 minutes. Add the Saucy Mama Cafe Orange Habanero Wing Sauce, syrup and stir to combine. Add 1 cup orange juice and bring it to a simmer, scraping up the browned bits from the bottom of the pan. Continue to simmer, stirring occasionally, until the mixture has thickened and almost all of the liquid has evaporated, about 8 to 10 minutes. Transfer the bacon jam to an airtight container. After it is cooled to room temperature, it can be refrigerated for up to 2 weeks. Rewarm before using. 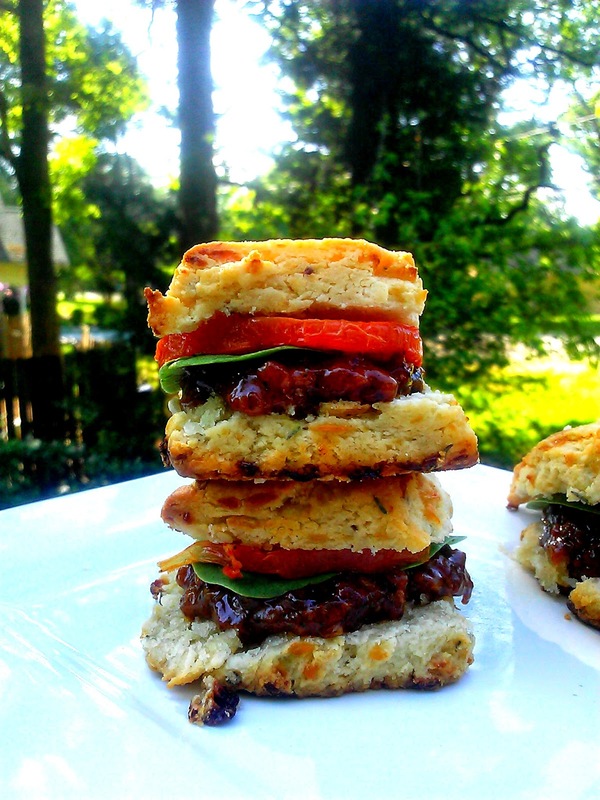 Cut biscuits crosswise and layer the inside of the biscuit with bacon jam; place biscuit top on. 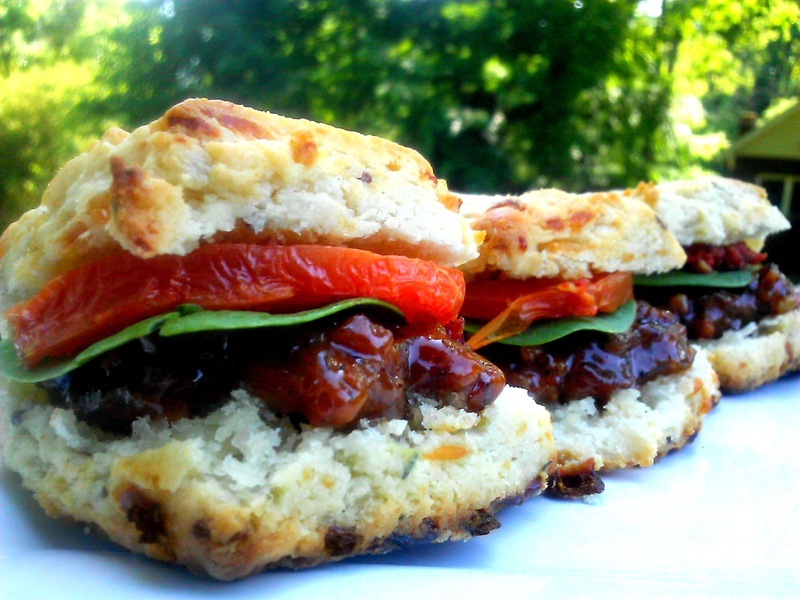 The biscuits and the jam can be prepared ahead, frozen and thawed out as needed. Tomato and spinach leaves for demonstration purposes only, but feel free to add them! Yum! Oh, I'd like a bite of that! Wow. I would eat that up SO fast! Love it!! Oh, my! What tasty little sandwiches!!! Fingers crossed for the win! Nik - you are going to win - how could you not - these sandwiches look fabulous - what I wouldn't give for one right now! So many wonderful flavors. I've never had a biscuit quite like this! Good luck at the contest. These are definitely a winner! 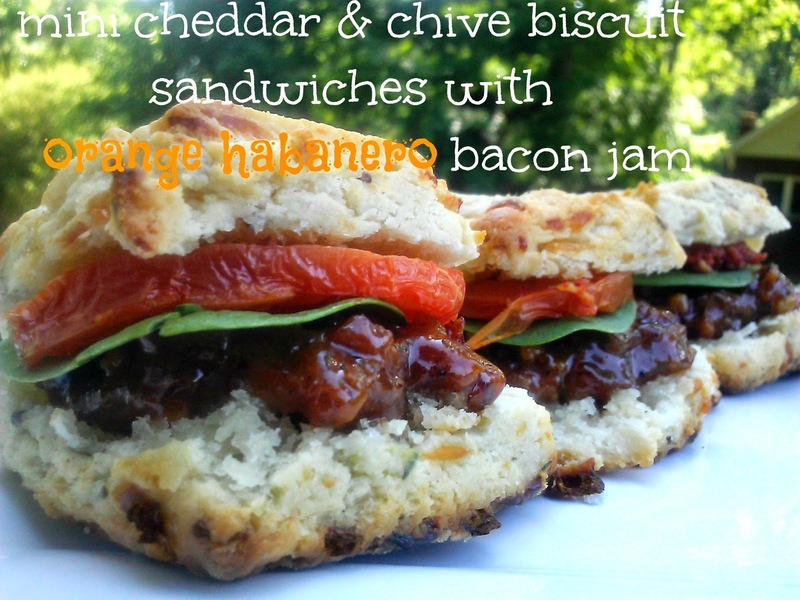 I don't know what I like more those biscuits or that bacon jam. Oh well you put them together, so it's a win. Yum! Those biscuits look great!